LGBTQ-Inclusive Hospice and Palliative Care is a thoughtful manual for care providers that acknowledges a broad variety of perspectives. Kimberly Acquaviva’s considerate and well-researched LGBTQ-Inclusive Hospice and Palliative Care is a guidebook for careworkers who are looking to offer equitable and compassionate care in life’s hardest moments. Aspiring to encourage a rigorous standard of care, Acquaviva’s book fills a gap in hospice literature, which has not always addressed LGBTQ people specifically or at all. Here, chapters address gender and sexual orientation terms, encourage precision of language, and draw important distinctions between gender nonconformity and gender dysphoria. Included in the book are comprehensive intake questionnaires, tables of outcomes and behaviors, checklists for funeral planning, and conversation guides for discussions of patient care. 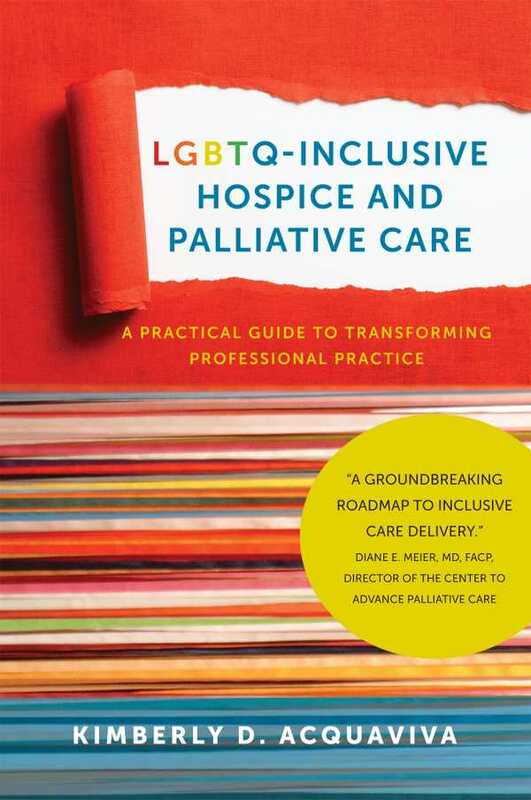 In addition, the book forwards extensive background information on how hospice and palliative care practices provide inclusive environments for LGBTQ patients and families—or on how they fail to do so. Building an argument for taking personal biases and beliefs out of the care process, the book argues for a higher ethical standard and equitable care. Most effective are the sections called “Provider Perspective” and “Family Perspective,” which are made up of anecdotes from individuals who have participated in the hospice and palliative care process with LGBTQ patients and families. Excellent at being both clinically precise and compassionate, the text uses inspirational language to remind caregivers of the value of their work to their patients. The book is accessible to a variety of practitioners, including chaplains, physicians, and registered nurses. Clear objectives precede all chapters, and key points, discussion questions, and chapter activities come at the end, making the material engaging and formatted for quick reading. Topics range into broader issues as well, like how to incorporate family decision-making into the care process. A variety of outside resources are referenced, and all information carries credibly forward. The book’s case studies are long enough to illustrate their points well, and the text does an excellent job of summarizing the contexts and care standards that are relevant to LGBTQ-inclusive care. Always mindful of the moments in the care process in which LGBTQ people and families are most likely to experience different treatment or attitudes, the book focuses on collaborative decision-making. It consistently encourages its care provider audience to self-reflect when it comes to their own attitudes and biases, and the end result is a project that is cohesive and encouraging. Focused, precise, and informed by science, LGBTQ-Inclusive Hospice and Palliative Care is a thoughtful manual for care providers that acknowledges a broad variety of perspectives.